An allergy to eggs can cause a range of reactions, from a mild rash to severe breathing difficulty. Egg allergies often begin in infancy or early childhood. As you grow older, your body may adjust to the proteins in eggs that trigger allergies, and you may be able to enjoy these nutritious foods. However, if you have even mild signs of an egg allergy, eating eggs or foods that contain eggs may lead to a severe reaction. Consult your doctor immediately if you have signs of a reaction to eggs. An allergy specialist can determine whether you or your child have an egg allergy through skin tests, blood tests or dietary monitoring. Because influenza vaccine contains small amounts of egg protein, you should check with your doctor before having a flu shot. An abnormal immune response to the proteins in egg whites or yolks causes allergic reactions to eggs. When you eat foods or take medications that contain eggs, your body produces antibodies that trigger a release of histamine, a chemical that causes swelling, respiratory irritation and other allergic symptoms. Most signs of an egg allergy occur within several minutes to several hours after you've consumed a food that contains eggs. 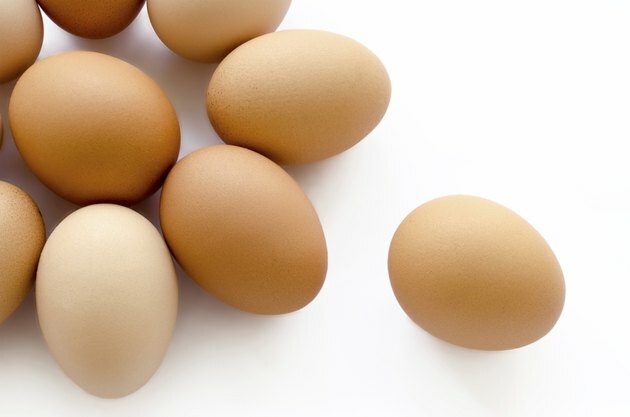 Inflammation of the skin is the most common sign of an egg allergy, according to MayoClinic.com. You may have an itchy, bumpy rash, hives or swelling around your mouth. Children who suffer from atopic dermatitis, a skin condition that causes chronic skin rashes, are more likely to experience egg allergies. Egg protein is a common food additive, and any foods, medications or cosmetics that contain egg products may cause a reaction if you have an allergy. Some people with chicken egg allergies also have allergies to quail, duck or turkey eggs. An upset stomach, nausea, vomiting, stomach cramps or diarrhea after eating eggs may be signs of an allergy. Most children with egg allergies are able to digest eggs without difficulty by age 5. Check the labels on foods, medications or beauty products for statements like "contains egg ingredients." Some products that contain proteins derived from eggs, like lecithin or albumin, may not be labeled as egg-containing foods. Products made in a facility that processes eggs may also stimulate an allergic response. If you have concerns about a food or medication, contact the manufacturer to confirm whether the product contains egg ingredients. When your immune system reacts to egg protein, the release of histamine can affect your respiratory system. You may have a runny, inflamed nose and itchy or watery eyes. An egg allergy can cause asthma symptoms, such as wheezing and difficulty breathing. People with an allergic reaction to eggs may also have reactions to the proteins in milk, soy or peanuts. In extreme cases, a respiratory reaction to eggs can block your airways and interfere with breathing. A severe egg allergy can cause a life-threatening response called anaphylaxis. Symptoms of anaphylaxis affect your entire body. Your mouth, throat and the air passages in your lungs may swell, obstructing breathing. You may have abdominal pain, nausea and vomiting, itching and swelling of the skin and a rapid pulse. Your blood pressure may drop, causing dizziness, fainting and shock. If you or your child has a severe egg allergy, your doctor may prescribe epinephrine, an injectable medication used to treat severe allergic reactions. Your doctor will teach you how to administer epinephrine during an emergency. If you or your child have an allergic reaction to eggs, seek emergency medical attention even if you have had an epinephrine shot.